I had planned on making my own R2D2 costume (at my daughter’s request), but since Halloween plans were dampened by a bad week-long case of strep throat for the little one, I was a bit distracted, and time sort of slipped away. Luckily, inspiration struck at the grocery store, when I found a sad little kid’s Vader costume for 6 bucks in the Halloween aisle. It came with a tiny cape that was way too tight around the neck, so I just extended it by sticking a longer piece of velcro to it where the ends met up. I mean, technically, Vader DID CREATE C3PO, so I think it’s a better companion piece than R2. …At least, that’s what I’m telling myself. But Vader alone wasn’t enough–I wanted to spice it up a little, so I wore a sugar skull shirt (because it’s black and I already own it), which gave me the idea of painting the helmet. There are a bajillion sugar Star Wars characters online (which I love), so I just grabbed a paint pen (which I already had) and BOOM–two minutes later, my costume was complete. The kid was feeling better, but still pretty sick, so we just went down the street & back. She had a chance to do her thing, and then she had fun handing out candy. People seemed to dig her homemade costume. 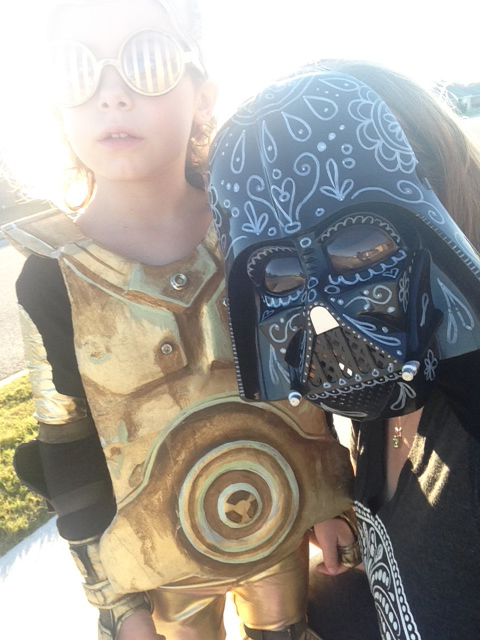 We even saw a kid dressed as Vader, one as Yoda, and another as a Jawa! Star Wars still lives, if you ever have your doubts. So if the costume giddiness is over and you’ve got the dressup blues, I present, for your consideration, a paper doll I made ages ago for an art show I once had. She’s got a mix of old-skool circus performer, pinup girl, derby blocker, and steampunk fanciness. And if paper dolls aren’t your thing, just head on over to that bucket of candy. There’s one in there calling your name…. One of my favorites at our church trunk or treat was a Star Wars family: Dad was Obi-Wan, Mom was Leia, kids were Vader, an Ewok and Yoda. And I love that you whipped that out in 2 minutes. The resourcefulness of mothers never ceases to amaze and inspire me. MacGyveresses all. I like the results! Hope you all had a great time. Great costumes! Those golden goggles – genius! And compliments on sugar skull tee and Vader’s helmet combo – can imagine how cool and powerful it looks in full frontal view. Hope your little one gets well soon, good vibes your way! Thank you so much! She actually was the one who insisted that part of the costume be the “stripes in his eyes.” My husband came up with the idea of glasses, since we didn’t want her whole face covered. Turned out pretty fun! And thanks for the well-wishes–she’s feeling much better now! Ah, thank you so much! I got a little round of her funk right afterward, but it went away fairly quickly. Gotta love the kid-germs! As a derby skater, I am beyond thrilled to see your artistic rendition of a blocker! 😀 The collaborative pieces which you created with your daughter is what brought me to your blog. Love your work and will be purchasing some of your prints in the near future as gifts! Halloween is only just becoming a thing in Australia. We were fired up to participate this year but my son’s insistence that it was dress-up day at at school (nothing in the newsletter, no word on the parent grapevine) turned out to be misguided. He had gotten bad intel from another kid and was the only one who turned up to the school bus in vampire garb. *tears, home to change..